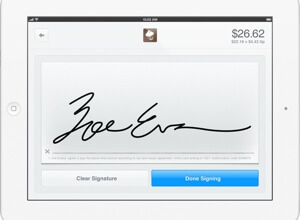 With Square Register customers sign the tab with their finger. Makers of mobile credit card reader, Square, have taken the next logical step. Not only can your iPad become a credit card reader, it can become a cash register now too. The fast-growing startup has developed an app, Square Register, to go along with their card reader. More than just payment processing software, Square Register offers versatility that comes with being an iPad app. Customers can pay with credit card or cash, and regular customers can leave their wallets at home and pay simply by giving their name. Merchants can organize their items by adding names, photos and prices. Customers complete the sale by signing the iPad with their finger. Unlike conventional registers, Square Register also comes with analytics that merchants can login to from anywhere and view their transaction details. Square Register brings yet another affordable mobile payment service to “mom and pop” stores. A large part of why Square is so appealing to small businesses is that it gives them an alternative to signing contracts with major credit card companies that typically have high upfront costs and monthly fees. Here’s Square’s video showing just how cool a cash register an iPad makes. The mobile payment market is set to explode. Expected to grow to $600 billion by 2016, companies are scrambling to get a piece of the marketshare. Google Checkout allowed you to make online purchases with your Google account. This past November they expanded their mobile payment capabilities by replacing Google Checkout with Google Wallet. Like your real wallet, you can pay with Google Wallet at an online store or in a real store down the street. If your local coffee shop has the right logo, you simply tap your smartphone on the logo and away goes your payment through near field communications technology. With tap-to-pay your phone is your wallet. PayPal is also rapidly developing a digital wallet. Last month Paypal announced that customers at 2,000 Home Depot stores across the US will be able to pay with their Paypal accounts using their PayPal card, or mobile phone number with a PIN. VISA, it's everywhere you – and your smartphone – want to be. 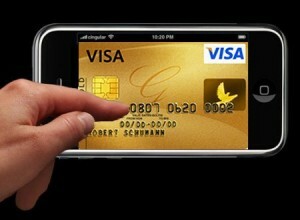 Wireless giants AT&T, Verizon and T-Mobile are also developing mobile payment services. And they’re competing with retailers themselves. Wal-Mart and Target are part of about two dozen retailers working together to come up with their own mobile payment systems independent of banks, credit card companies and technology companies. Even Facebook is trying to incorporate payment platforms onto your Facebook page. For their part, Square is doing its best to stay ahead of the curve against the behemoths. And they’re doing a good job. Founded in 2009, the company received $100 million from investors last June. In November billionaire Richard Branson committed a “multimillion” dollar investment to Square. Last October the company boasted $2 billion in payment processing. On March 5th Square creator and Twitter co-founder, Jack Dorsey, Tweeted “Today we’re processing $4 billion a year.” In October 800,000 people were using Square and by December, over a million. As both a processing and organizing tool, Square Register will probably spur the company’s growing popularity even more. PayPal’s founder, Scott Thompson, is probably right in predicting that, in just a few years, we won’t need to carry wallets anymore. Is it me, or is paying with cash more and more getting to feel old school? Especially for, say, purchases more than $10. And it’s probably only a matter of time before wallets themselves mean, somehow, for some ridiculous reason, you left your smartphone at home.